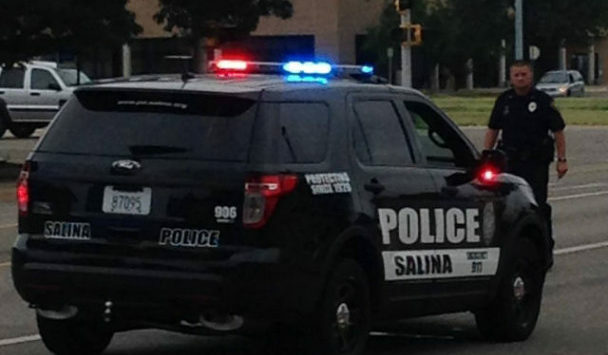 Salina Police are in search for two black males who were caught on video surveillance using stolen credit cards. Police Capt. Paul Forrester tells KSAL News that authorities were called to Planet Fitness, 2012 S. Ohio, in reference to two separate vehicle burglaries that happened between 6 a.m. and 6:10 a.m on Thursday. Two female victims both received alerts on their phones that their credit cards were being used at the Salina Wal-Mart, 2900 S. 9th St. When the two victims went to check out their vehicles, they found that their vehicle’s windows had been smashed and items inside stolen. One victim had a diaper bag containing credit cards, IDs and $80 in cash stolen. Total loss with the damage to the car is $600, while the second victim had $400 in losses and damages after the suspects stole her purse that had credit cards, change and sunglasses inside. Authorities then went to Wal-Mart and found that the two suspects made two purchases of Visa prepaid cards for $1,010 with one of the victim’s credit card. A third attempt of $505 was tried, however, the card was then declined. The other victim’s card was attempted to be used for the same item, but it was declined. After reviewing surveillance, officers are searching for two black males. One is wearing white pants and a white and gray hoodie. He is described with a thin build and approximately 5’5″ tall. The other suspect was wearing a purple Nike sweatsuit and a black cap and is medium build, average height. The two left the store in white or light colored SUV headed south. Forrester is reminding the public to either take anything of value with you in to the store or lock it in the trunk. Don’t leave anything of value in plain sight in your vehicle.